Monasteries had special services everyday in which the dead of the community were commemorated. It took place in the chapterhouse after morning prayers or mass and consisted of reading aloud in turns a chapter from the rule followed by the community, the names of saints whose feasts would be commemorated on the following day and reading of the names of the deceased of the community and names of important friends who had given them support. The lists of names of saints and of the dead along with a calendar and other texts important to the monastery, such as its rule, were collected in a book called a 'martyrology.' A very old, large and important community such as the priory of Christ Church, Canterbury, would have a massive list and collection of texts important to it. This martyrology of Christ Church records names and events from the 14th to 16th centuries. The martyrology includes special services and prayers for members of the community. 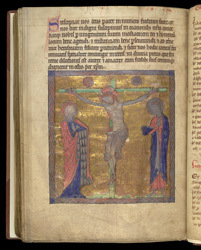 This prayer has a picture of the Crucifixion below it, which would have served as a devotional aid rather than as an illustration. Members of the community would have contemplated it in prayer to be reminded of and identify with the suffering of Jesus. A main purpose of the devotions of the daily prayers of monastic communities was a kind of penance for the good of Christianity.